Continental pipe and tube cutting machines use the rotary tube cutting method to produce fast, clean cuts—faster and more cleanly than any other method. Because no chips are produced and coolant is rarely required, the tube cutting work area and parts stay clean and dry. Plus, rotary pipe and tube cutoff produces minimal burrs so deburring operations generally aren’t required. Tooling for Continental pipe cutting machines consists of inexpensive but long-lasting cut-off blades that are available in a range of configurations for different tube cutting conditions. They can be easily re-sharpened using our Model 1G Blade Grinder (see below) or, we offer a very economical re-sharpening service at the factory. 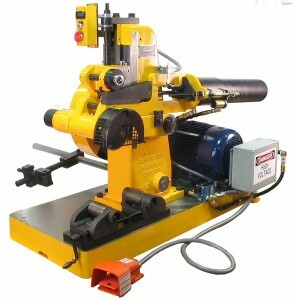 Continental’s pipe and tube cutting machines are very simple making them fast to set up and easy to operate. Operators will be fully up-to-speed on set up and operation quickly. Plus, they are rugged and easy to maintain. Many Continental customers are regularly running Continental pipe cut off machines that are over 50 years old. Machines are available to cover the complete range from 1/4” to 12-3/4” diameter and up to 5/8” wall. Browse our range of pipe and tube cutoff machines to see which is best for your application, then give us a call or fill out our “Contact Us” form for detailed information, including pricing. 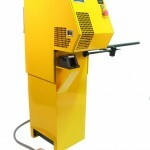 Our Model 2A small diameter tube cut-off machine is air-operated and has a range of ¼” to 2” diameter. 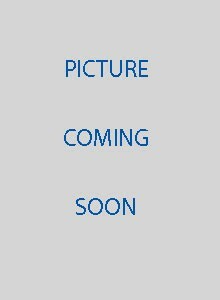 It is economical and very compact with a footprint of just 16″ X 18″. Infeed tube support tables are available for various tube stock lengths. Our Model 2B is a manually operated tube cutting machine for lower volume tube cutting applications. It is suitable for 1/4” to 2” diameter and up to 5/32” wall thickness. It is extremely easy to set up and operate and is very compact. The Model 2B can be bench mounted or used with our free-standing pedestal (pictured). Infeed tube support tables are available for various tube stock lengths. The Model 3A is our most popular pipe and tube cut-off machine and has a range of ¼” to 4-1/2” diameter and up to 3/8” wall thickness. It is air operated and is used in a wide range of applications from furniture manufacturers to automotive components. Our 500 Series infeed tube support tables are available for the Model 3A. They use a modular construction to provide support for virtually any stock length. Automatic feeders are also available for the Model 3A. Our Model 3H is a manually-operated machine for cutting pipe and tube 1/4″ to 4-1/2” diameter and up to 3/8” wall thickness. It is extremely easy to set up and operate. The Model 3H is best suited for lower volume applications. Our 500 Series infeed tube support tables are available for the Model 3H. They use a modular construction to provide support for virtually any stock length. The Model 6A is a popular pipe and tube cut-off machine and has a range of 3/8″ to 8-5/8” diameter and up to 1/2” wall thickness. It is air powered and is used in a wide range of applications from oil field products to heavy-duty truck components. Our 500 Series infeed tube support tables are available for the Model 6A. They use a modular construction to provide support for virtually any stock length. Automatic feeders are also available for the Model 6A. Our Model 6H is a machine for cutting pipe and tube 3/8″ to 8-5/8” diameter and up to 1/2” wall thickness. It is extremely easy to set up and operate. The Model 6H is best suited for lower volume applications. Our 500 Series infeed tube support tables are available for the Model 6H. They use a modular construction to provide support for virtually any stock length. 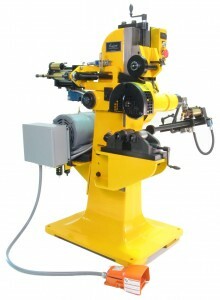 The Model 12A is our largest pipe and tube cutting machine. It is air-operated and has a range of 3-1/2″ to 12-3/4” diameter and up to 5/8” wall thickness. 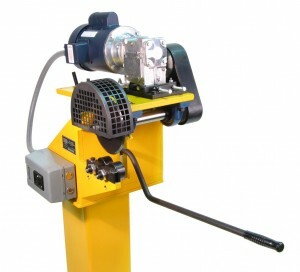 It is suitable for cutting large, heavy-wall pipe or tube and is much faster than cutting with a band saw. Our Model 1G allows you to quickly re-sharpen cutoff blades right at your location. 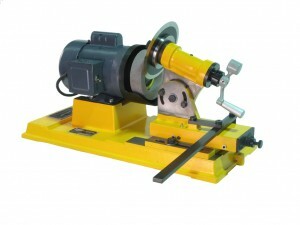 It is simple to use and since the blades can be re-sharpened many times tooling costs are kept very low. Alternatively, we offer a very economical re-sharpening service at the factory with quick turn- around.